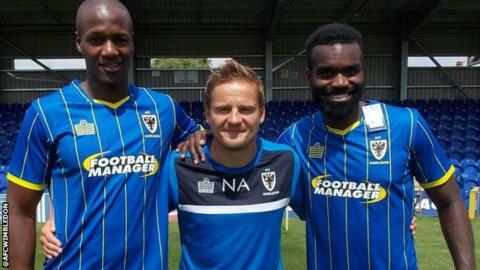 Wimbledon boss Neal Ardley (centre) described Osborne (right) as "strong, athletic and powerful"
League Two side AFC Wimbledon have signed forward Tom Elliott on a permanent deal and defender Karleigh Osborne on a season-long loan. Former Leeds trainee Elliott was a free agent after leaving Cambridge United last month. The 24-year-old scored 26 goals in 83 appearances during a three-year spell with the U's. Former Brentford and Millwall centre-back Osborne, 27, joins from Bristol City until 31 May. The Dons have not disclosed the length of Elliott's deal at Kingsmeadow. The duo become the south-west London club's third and fourth signings of the summer.